Under några kyliga dagar i november gästades Medelhavsmuseet av en forskare på forntida växter från Egypten, Mennat-Allah El Dorry. Hon hade kommit för att kika på några gamla lådor med arkeologiskt växtmaterial, som tillhör museets egyptiska samling. 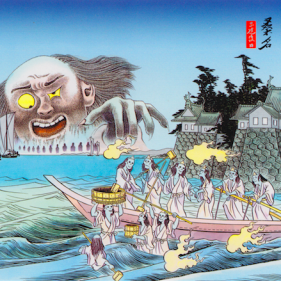 Här finns nämligen fröer som är över 6000 år gamla (!) från en boplats i Nildeltat, Merimde Beni Salama, och som Menna just nu forskar om. Här berättar hon själv (på engelska) om sina undersökningar, och om hur kunskapen från de gamla fröerna långsamt börjar gro. 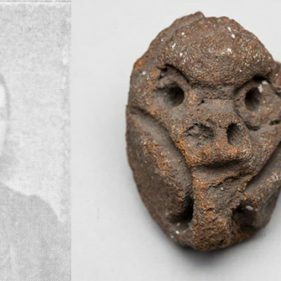 In the 1920s and the 1930s, the Egyptian Museum in Stockholm (Egyptiska museet) scientifically supported excavations run by a German archaeologist, Hermann Junker, at a prehistoric Egyptian site called Merimde Beni Salama. 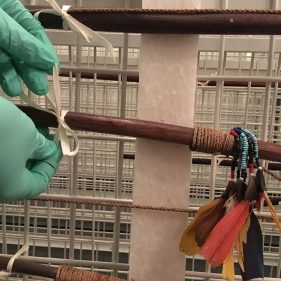 As a supporting institution, the museum was entitled to receive a share of the archaeological finds, including ceramics, stone tools, an imal bones and even plant remains. This “partage” or splitting of the finds was the norm in the early twentieth century, but since the 1970s no longer in operation. 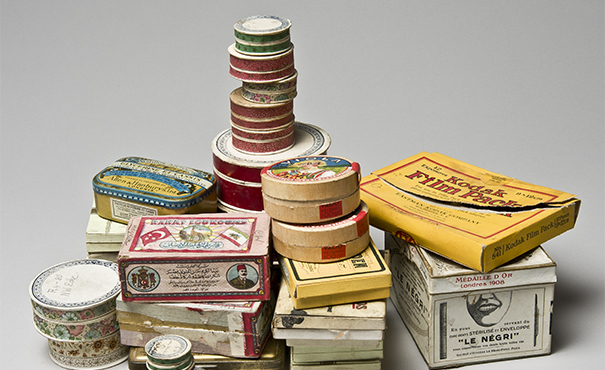 Today, these items are partially on display and partially in storage at the Medelhavsmuseet. 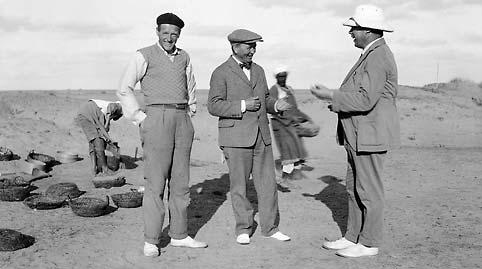 Archaeological work in the Nile Delta, in the early 1930s. 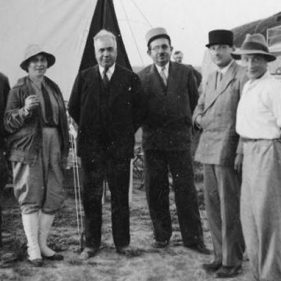 At the front: Archaeologist Egil Lönnberg (left), Professor Hermann Junker (centre), Director of Egyptiska museet in Stockholm Pehr Lugn (right). In the background workers and their baskets used to transport sand and debris can be seen. This material is what brought me to Stockholm. I am specialised in archaeobotanical analysis, or the study of archaeological plant remains. Archaeobotany and the study of the flora that has survived on archaeological sites, help us to better understand ancient climates and learn more about how humans interacted with the plant kingdom. By looking at archaeobotanical material, I´m not only learning about what people ate, but also about how they cooked and prepared food, how they cultivated crops, what crops were traded, what they used to feed their animals and what they used as fuel to light fires and ovens. The site from which the material originates, Merimde Beni Salama, dates to the Neolithic period, which is the time when people started settling down and farming, rather than relying on hunting and gathering for their sustenance. This makes it an exciting time to learn about how humans learnt to cultivate and to use plants. My work in Stockholm included identifying and counting the remains. All the material is grains or seeds of plants, like cereals and weeds, in addition to charcoal. Some samples come from silos, and these are largely emmer wheat grains. Many of the wheat grains have bits of their rachis holding on to them (the rachis are the bits that hold the grain). This suggests to me that the grains were stored in the silos with their rachis intact, perhaps as a measure against vermin and rodent attacks. To the left is a grain of emmer wheat (Triticum dicoccum) still cuddled in its rachis. This, and many more examples from one of the silos, suggests to me that the grains were stored in their rachis, which could have been intended to protect the crop from rodent attacks. 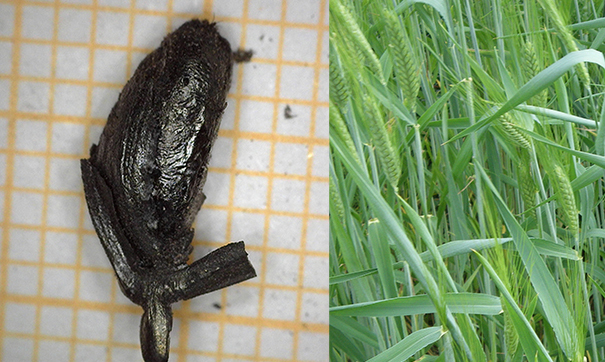 The image to the right shows emmer wheat in the field (via Wikimedia Commons, Alupus). The grains are also accompanied by many little legume sorts, which were probably wild weeds infesting the wheat fields. It is fascinating to me to see the different weeds that are accompanying the grains. Weeds grow on certain fields and under specific ecological conditions, such as sandy soils or well irrigated silty lands etc. The way farmers deal with the crop also makes a difference in what weeds survive. I am still drawing up my data collected during my visit, to see what these weeds can tell me about the growing conditions of the soils they grew in, and the agricultural practices that happened around them. I am interested in learning if they differ to the weeds, and therefore in ecological condition and crop husbandry, of pharaonic Egypt when agriculture was well established. 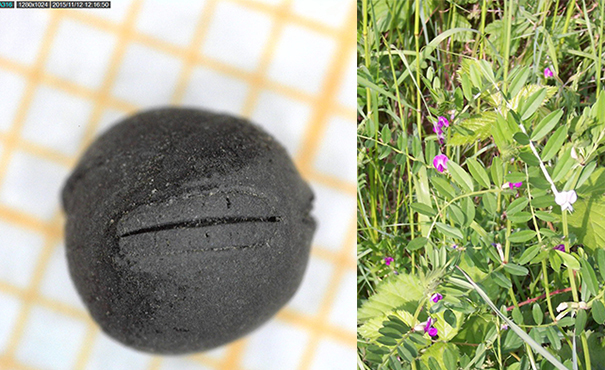 This small rounded seed (left) is a legume, probably a Vicia sativa type (fodervicker in Swedish) seed. It is commonly a field weed (right, image via Wikimedia Commons, Eike Wulfmeyer), but can have its own uses such as animal fodder. The surface of the seed is completely missing. The thick line running at its top is the hilum, the scar left behind by the stalk that once attached the seed to the ovary walls; you can think of it as a belly button of a plant! The hilum is one of the diagnostic parts of plants and can help me confirm my identification. I tried to get as clear a photo as I could, so I can compare it to a reference collection. A really cool digital reference collection accessible to the public is the Digital Plant Atlas Project. Junker mentioned in his publication that in some burials, the corpses had grains on their faces or even in the mouth. I do not know of any parallels from Egypt, and have no idea why people would have done that! I am still trying to understand what is going on and looking for parallels. The material I have looked at so far has been so cool. My brain is exploding with questions! Why did they bury their dead with grains on their face? How did they deal with weed infestations on agricultural lands? Did any of the weeds have any uses that would have made people encourage their growth on the fields? How did these species arrive on the archaeological site in the first place? How did people learn how to grow and use plants? 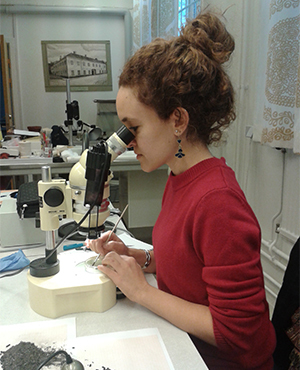 Working on this material in Stockholm was also very special because of the long-standing Egypt-Stockholm archaeobotanical connection. The godmother of Egyptian archaeobotany, a Swedish woman named Vivi Täckholm, worked many years on the field in Egypt studying my home country Egypt’s, modern and ancient flora. My trip was just an exploratory visit. I now know that the material is really worth spending more time to study, and I hope to return soon. Perhaps at a more opportune time of the year, weather wise! Not only do I want to sort through the reminder of the material from Merimde Beni Salama, but I would love to revive the Egyptian-Swedish archaeobotany tradition! A microscope is used to study the seeds up close. My visit to Stockholm came as part of a fellowship I undertook in the Freie Universität Berlin’s Excellence Cluster Topoi. Field work at the site of Merimde Beni Salama was resumed in 2013 by Professor Joanne Rowland of FU-Berlin, and supported by the EES in the UK and Topoi.